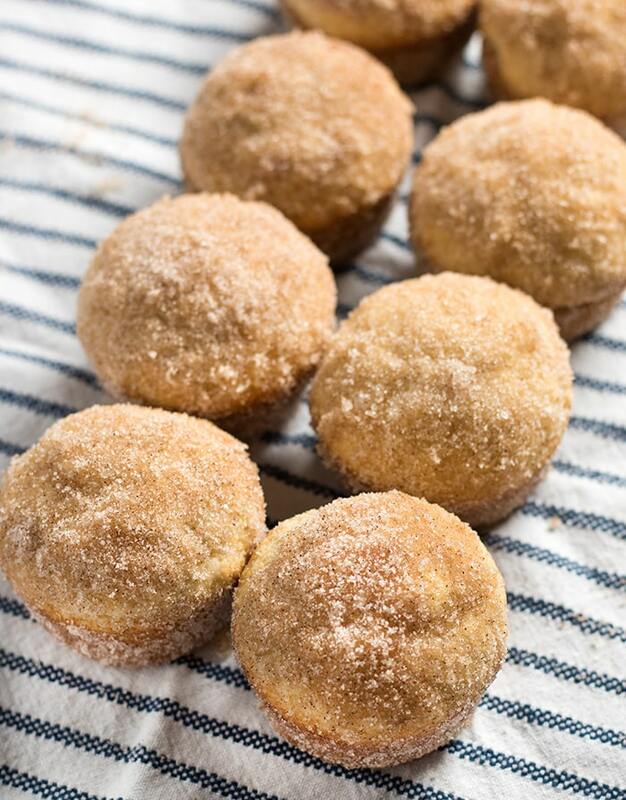 Cinnamon Sugar Donut Muffins – Donut muffins are a super soft, homemade muffins that are easy to make! These buttery treats taste just like an old fashioned donut rolled in cinnamon and sugar! Yep. I’m that person that will take a donut that’s all soft, and buttery, and rolled in cinnamon sugar over a glazed donut any day of the week! I mean, is there anything more satisfying than licking off all that cinnamon sugary goodness that gets stuck to your lips? Not really, guys. Not really! Anyway, I’ve been making these donut muffins for years. I do believe I first learned to make them during French class in high school….which was like, a bajillion years ago. Of course I’d remember the muffin recipe, but not a single word of French! It doesn’t matter how long it’s been though, these muffins reign supreme as my kid’s favorite breakfast treat. Typically treats like this are reserved for weekend breakfasts – BUT, school is out for summer. I think that’s a good enough excuse to make these on a Tuesday. Basically, I’ll come up with any excuse, these are that good. The actual muffin is a super simple batter. But, don’t be fooled by the simplicity – they have this amazingly light flavor of vanilla and spices. Then, when they come out of the oven I generally give them just long enough that I can handle them without burning my finger tips straight off before I dunk them in butter and roll them in cinnamon sugar. These absolutely store really well, but they’re definitely on another level of delicious when eaten still warm. Also, you probably won’t have any left to save. Better just make a double batch to be on the safe side. 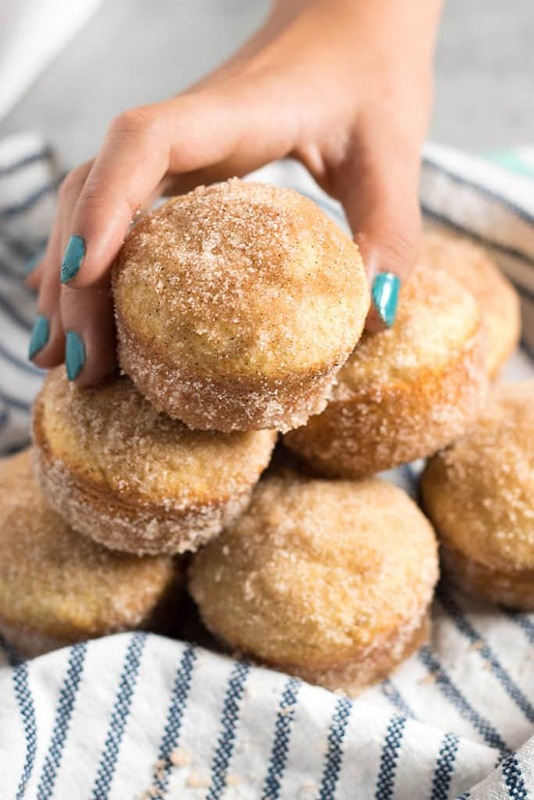 Cinnamon Sugar Donut Muffins - Donut muffins are a super soft, homemade muffins that are easy to make! These buttery treats taste just like an old fashioned donut rolled in cinnamon and sugar! Preheat oven to 350 degrees. Grease muffin cups or line with paper liners. Set aside. In a large bowl whisk together the flour, sugar, baking powder, salt, cinnamon, and nutmeg. Set aside. In a small bowl beat the egg. Add the milk, vanilla extract, and melted butter and mix well to combine. Add the wet ingredients to the dry ingredients and stir just until moistened, being careful not to over mix. Spoon batter into muffin cups about 1/2 - 3/4 of the way full. Bake in preheated oven for 20-25 minutes. Allow muffins to cool for 5 minutes before removing from pan. For the topping: In a small bowl mix together the cinnamon and sugar. In another small bowl melt the 5 Tablespoons of butter. Dip the muffins into the butter, then roll in the cinnamon sugar mixture. I shared this muffin recipe over at The Weekend Potluck! 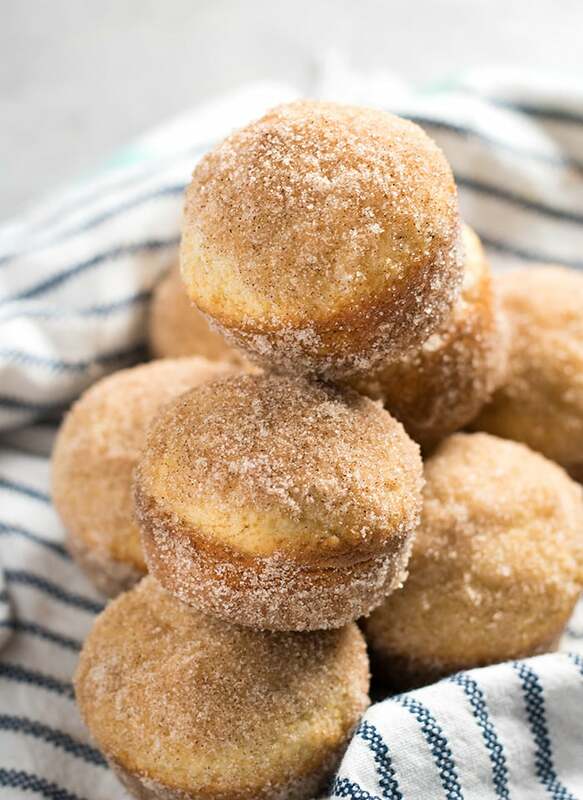 Cinnamon Sugar Donut Muffins: An easy recipe for cinnamon sugar muffins that taste like an old fashioned donut! These simple muffins bake up in no time and are perfect for breakfast. 0 Response to "CINNAMON SUGAR DONUT MUFFINS"